A movie about obsession, jealousy, and the uncomfortable realisation of one’s own mediocrity in the face of undeniable genius, Amadeus is a breathtaking spectacle, a transformative piece that takes an unsubstantiated rumour from the lives of Mozart and Salieri, and spins a web of intrigue and deception around Mozart’s untimely death. Adapted by Peter Shaffer from his original stage play, and brought to mesmerising life by Miloš Forman, it’s a movie that brims with unbridled passions, from Mozart’s immersive approach to his music, to the stylistic excesses of the Emperor’s court. Mozart himself is presented as an enfant terrible in adult form, giggling uncontrollably as much from nervousness as exhilaration, and challenging the conservative musical conventions that have provided Salieri and his ilk with their success. 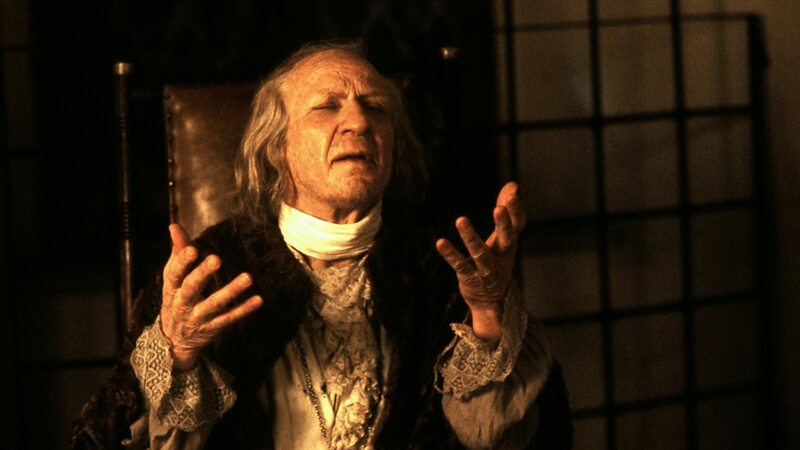 As if his grandiose behaviour wasn’t enough, he’s also – actually – incredibly gifted, something that Salieri cannot fathom: how can God have done this, how could He have given such a gift to Mozart and left Salieri with the same passion but without the means to express it as effectively. Salieri’s battle with God over this becomes its own obsession, and informs his actions throughout. Shaffer builds the one-sided rivalry between Salieri and Mozart and uses it to explore the nature of thwarted ambition. Salieri’s need to be seen to be superior to Mozart consumes him, and while Mozart’s own lifestyle consumes him at the same time, Shaffer highlights the desperation that drives Salieri on to a darker place than even he could have predicted. Abraham is quite simply superb as the tortured composer, a man aware of his limitations but compelled by those same limitations to contemplate murder for personal gain. Hulce is just as good as the potty-mouthed genius who transcribed whole pieces of music without the need for any corrections; as his physical health deteriorates, Hulce shows us a Mozart whose commitment to his music over-rides his own sense of self-preservation. Both performances are powerful, emotive, and finely judged, and form the backbone of a movie that never falters in its appreciation of the one thing both characters agree on: the sublime nature of Mozart’s music. Inevitably, the soundtrack is filled with astutely chosen examples of Mozart’s work (even his playing of Salieri’s march is really an excerpt from Mozart’s own work The Marriage of Figaro), and it’s all played out against a backdrop of naturally lit interiors and ravishing production design, all of it enhanced by Miroslav Ondrícek’s detailed cinematography. 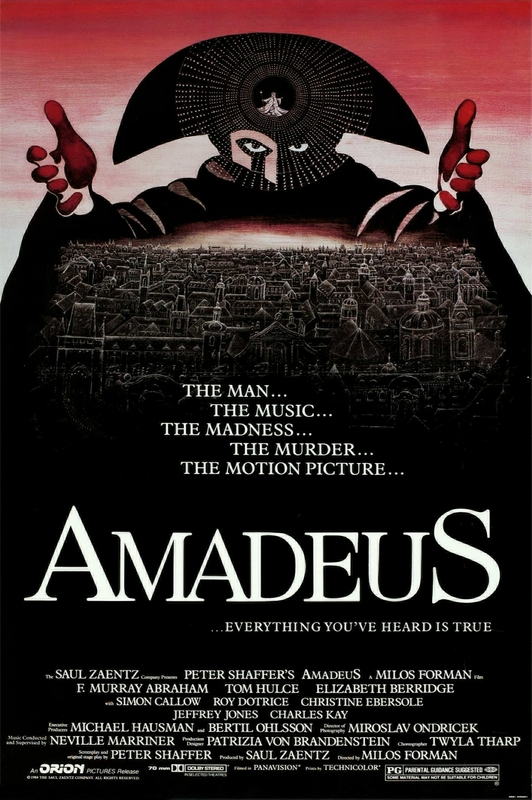 Rating: 9/10 – from Salieri’s first anguished cry of “Mozart!” to his absolving mediocrities everywhere, Amadeus is an ambitiously mounted movie that succeeds in breathing potent life into a minor footnote in classical music history; devastating in places, but with a streak of scandalous humour to offset the darker nature of the movie’s second half, this is hugely impressive on so many levels, and possibly Forman’s finest work.